Just in time for Mother’s Day! 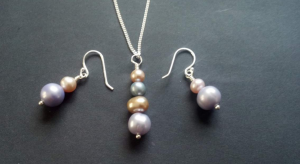 Bring your Mom in and make a Sterling Silver and Freshwater Pearl Necklace and Earring Set together…One for you and one for her. Or surprise her with a handmade gift of your creation, made specifically with her in mind! Instructor Trista Langley-Tyler of Metal Urges will take you step-by-step through making a special set using any number, color, and size pearl you choose. During the class you will also learn about the basic tools needed, where to get your own tools and materials, and the basic working properties of sterling silver and other jewelry making metals. All components are solid .925 sterling, so this is truly a nice addition to anyone’s jewelry collection. This class is appropriate for anyone 10 and up, who has confidence in their manual dexterity. The Inspiration Bar will also be open for purchase of wine, beer or other beverages including soda, tea or coffee.